The Bajio region is comprised of the four central Mexican states of Guanajuato, Queretaro, Aguascalientes, and Jalisco. The automotive industry in the Bajio is home to a full fifty percent of the nation’s productive capacity in this important manufacturing sector. The automotive industry in the Bajio, and in the country in its entirety, began to peak in 2010. By 2015 Mexico became the seventh largest producer of passenger vehicles in the world. Only China, the United States, Japan, Germany, India and South Korea manufacture more units annually. The rise of the automotive industry in the Bajio, and, by extension, of Mexico as a whole began in earnest in 1994. At that time a million passenger vehicles were produced. By the year 2014, Mexican manufacture of automobiles increased, and nation’s industry produced above three million automobiles. Experts estimate that by the year 2020 production will exceed five million. It is generally agreed that the automotive industry in the Bajio will be the source of a full fifty percent of the total by that time. With the development in the automotive industry in the Bajio, Tier 1,2, and 3 suppliers have followed to supply Original Equipment Manufacturers or OEMs. In terms of the number of suppliers to the automotive industry in the Bajio, the state of Queretaro is in the lead. Not only does Queretaro have the most auto suppliers within its boundaries in the Bajio, the state leads the Republic of Mexico as a whole. To the growth that Queretaro has experienced in this sector it is noteworthy to consider that in the 1970s there were only six auto parts manufacturers with a local presence. Today Queretaro is home to seventy-eight auto parts manufacturers that employ a total of at least 50,000 workers. In addition to the automotive industry in the Bajio, the entire country has become a preferred destination for auto parts manufacturers. Major Tier 1 suppliers such as Delphi, Lear, Johnson Controls, Continental and Pirelli among many others have a significant presence in Mexico. In addition to these well-known companies, Mexico also houses 2,000 small and medium-sized companies that serve the automotive industry in the Bajio and in other regions of the nation. One of the key positive factors for the automotive industry in the Bajio is its geography. The region is completely flat which makes it an advantageous place at which to build manufacturing facilities. Also, its central position within Mexico makes it a place with a solid transportation infrastructure that is comprised of roads and rail. It is easy to ship product to the nation’s northern border, as well as to ship finished passenger vehicles to Mexico’s seaports. 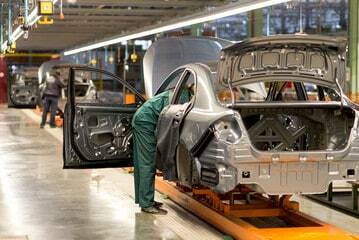 The most manufacturing activity in the automotive industry in the Bajio takes place in the state of Guanajuato. Over the years the entity has been the beneficiary of an estimated US $12.4 billion-dollar investment in the sector. At a recent Automotive Industry Summit, the governor of Guanajuato reported that his state’s automotive industry produced 763,000 autos and that production is projected to rise to 1.4 million units in the years to come. When that occurs one out of every four cars will be made in Guanajuato. Among the most critical auto parts produced by suppliers in the automotive industry in the Bajio are engines. At present, just shy of one million engines are produced today in the Bajio. This number is expected to exceed the million mark in the next several years. The region is also home to the significant production of passenger vehicle transmissions, tires, castings, machined parts, plastic components, cable and electronic assemblies, fiberglass components and stamped metal parts among other inputs. Perhaps the most critical advantage that is enjoyed by the automobile industry in the Bajio is access to a trained workforce. In the year 2017, the Multilateral Fund partnered with the Inter-American Development Bank (IDB) and the Community Foundation of the Bajio to combine resources to promote the digitalization education of the region’s workforce. This project has the support of twenty of seventy-four companies located in Castro del Rio Industrial Park in the city of Irapuato in Guanajuato state. It is the goal of the IDB and its partners to secure the participation of all the residents within the park by 2020. Additional industrial parks that will take part in the initiative in the near future are located in Silao and the towns of Cardenas and San Vicente. Other organizations that are playing a key role in training the workforce for the automotive industry in the Bajio include CONALEP, the National College of Technical Professional Education, the Higher Technological Institute of Irapuato, and the Virtual University of the State of Guanajuato.